Formed at Duxford on 1 September 1942 as a fighter squadron it was equipped with Typhoons, which remained its sole equipment its entire existence. The Typhoon suffered teething troubles in its early career and these eventually led to the aircraft being used in the fighter-bomber role. Following initial defensive operations against German low level raiders, 181 switched to an offensive role in February 1943. At this time its main targets were coastal shipping and later ground targets in Northern France. When the 2nd Tactical Air Force was formed in June 1943, No 181 was allocated to it continuing operations as before, but now as part of a mobile tactical Wing. Attacks on V1 sites began in January 1944 and the squadron began to adopt the use of rocket projectiles in February and equipped with such carried out operations against various targets in preparation for the forthcoming invasion. Following the invasion, the squadron supported the ground forces of the 21st Army Group, moving onto the continent two weeks after D-DDay. It continued in this role following the armies through France, into the Low Countries and eventually into Germany itself. It disbanded at Lubeck on 30 September 1945. Formed at Martlesham Heath on 25 August 1942, it received Hurricanes and began training as a fighter bomber squadron. Its main equipment began to arrive the same month and by October it was fully equipped with Typhoons. Operations began in January 1943 but it then undertook training in support of the Army before continuing its intruder operations in April. The following June the squadron became part of 2nd Tactical Air Force and adopted a mobile tactical role. Formed at Church Fenton on 1 November 1942, it failed to reach operational status until April the following year owing to the teething troubles experienced with the Typhoon. Operations began in the middle of that month and it was involved in fighter bomber attacks against coastal targets and enemy airfields. It replaced its bombs with rocket projectiles in November 1943 and from February 1944 it began attacks against communications targets in preparation for the forthcoming invasion. During this period it also conducted operations against V1 sites in the Pas de Calais area. In July 1944 the squadron crossed the Channel and operated from forward airfields in the beach-head area and as the armies advanced towards Germany No 183 accompanied them, operating from Holland by the end of the Year. In January 1944 it found itself supporting US forces during the 'Battle of the Bulge' and shortly before VE-Day it moved onto German soil. The month after VE-Day, the squadron returned to Britain and exchanged its Typhoons for Spitfire IXs, but before becoming operational these were replaced by Tempest IIs, which were flown until November when the squadron was disbanded by being re-numbered No 54. 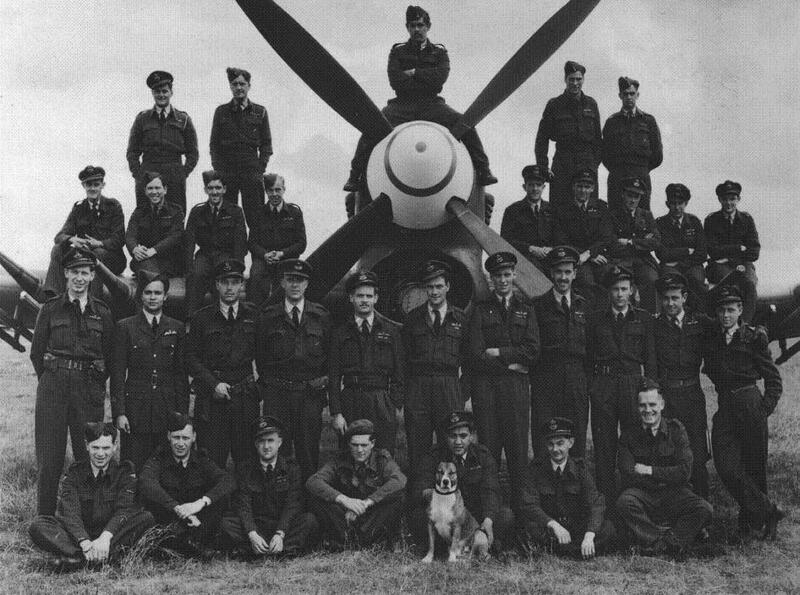 Formed at Colerne on 1 December 1942, it was to be a fighter-bomber unit equipped with the 20mm Cannon armed Hurricane IV. In May 1943 the IIDs were replaced with Hurricane IVs capable of carrying bombs and rockets. The squadron became part of the 2nd Tactical Air Force when it was formed in June 1943 and soon began carrying out anti-shipping strikes along the channel coasts. In October 1943 Spitfires began to arrive, but when re-equipment took place it was Typhoons that arrived. In the run up to the Normandy invasion attacks were carried out against a variety of ground targets, particularly communications. 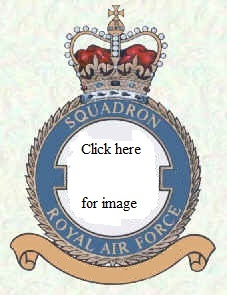 The squadron moved to the continent on 27 June 1944 and continued to support the army throughout the push to Holland and finally Germany, where the squadron arrived on 21 March 1945, becoming the first RAF squadron based on German soil. Support of the ground troops continued right up until the end of the war and the squadron remained as part of the BAFO until it was disbanded at Flensberg on 10 September 1945. Formed at East Fortune in the Torpedo-bomber role on 21 October 1918, it was equipped with the Sopwith Cuckoo. It was intended to embark the squadron aboard HMS Argus and to launch an attack against the German High Seas Fleet at its anchorage, but the Armistice intervened and the squadron never reached operational status, disbanding on 14 April 1919. No 185's second incarnation began on 1 March 1938, when it was reformed in the bomber role at Abingdon from 'B' Flight of No 40 Squadron. Initially equipped with Hinds, these were replaced by Battles in June 1938 and in their turn by Hampdens in June 1939. However, it was destined not to become operational, being used as a training squadron and eventually merged into No 14 OTU on 5 April 1940. The same day a new 185 Squadron began to form but its existence was short-lived, disbanding on 17 May 1940 Just less than a year later on 27 April 1941 No 185 reformed, this time in the fighter role on Malta. It was equipped with Hurricanes and was immediately thrown into defence of the island. Spitfires began to arrive in February 1942 and had replaced the Hurricanes by the end of the following month. Following the 'Torch' landing in November 1942 the squadron began offensive operations against enemy targets on Sicily and in July 1943 acted as part of the fighter cover for Operation Husky, the Allied invasion of the island. From February 1944 until the following August, the squadron provided a detachment for air defence duties in the Taranto area as well as offensive operations against targets in Albania, when the remainder of the squadron joined it from Malta. The squadron continued to provide air support to the Allied armies as they advanced up the Italian mainland eventually disbanding at Campoformido on 19 August 1945. No 185's final incarnation lasted from 15 September 1951 to 1 May 1953, initially on air defence duties of its original home, Malta, equipped with Vampires, however, it moved to Idris in August 1952, Nicosia in September and finally to Habbaniyah in October 1952, where it disbanded.